Corner-forward Cathal Mannion was speaking after Sunday’s win over Tipperary. AS THE GALWAY hurlers made their way from their dressing room under the Hogan Stand to the team bus, you’d never have guessed they’d just won a game of such magnitude. There was no back-slapping or celebrating from Micheal Donoghue’s men, instead they wore a steely look on their faces. Lots done, but plenty more work to do. “Sure, we have nothing won yet,” said corner-forward Cathal Mannion. “Our aim starting out this year was to get to the final and that hasn’t changed. Still, there’s another game left. Galway sides of the past have been accused of being mentally fragile, but this group is made of sterner stuff. Much of that is down to experience. 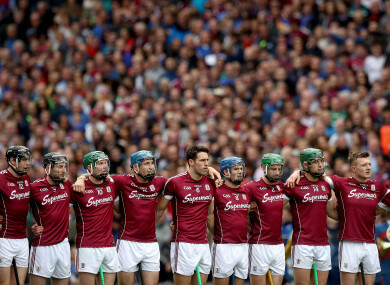 Three times the Tribesmen have competed in All-Ireland finals in recent times and they’ve failed to win all three – losing to Kilkenny in 2012 (after a replay) and 2015. Of the current squad, Joe Canning, Johnny Coen, David Burke, Conor Cooney and Jonny Glynn featured in all three finals. The majority were around for the four-point defeat two years ago. “It’s experience,” continued Mannion. “We’ve been through more bad days than good so we have to learn from that. Hopefully that will put us in good stead for the next day. “It’s head down for the next four weeks. It’ll be a tough four weeks and that’s what we wanted at the start of the year. “There’s hype there every year and that’s for the supporters. We have to keep our heads down because we have a job to do and that’s what we’ll do for the remainder. Poll: What two teams do you think will meet in the All-Ireland football final? Email “'The job isn’t done yet': Steely Galway not getting carried away as they approach final hurdle”. Feedback on “'The job isn’t done yet': Steely Galway not getting carried away as they approach final hurdle”.